An exclusive interview with legendary “Great Investor” Charles “Chuck” Royce. Royce pioneered investing in small company stocks with his Royce Pennsylvania Mutual Fund forty years ago this year. He’ll explain why high quality small cap stocks are undervalued compared to large cap stocks right now and the advantages they offer to investors from the vantage points of portfolio diversity, international exposure and income, three characteristics normally not associated with the small cap universe. On this week’s Consuelo Mack WealthTrack: one of the few economists to foresee the global economic slowdown. Gluskin Sheff’s David Rosenberg saw signs of trouble as chief economist at Merrill Lynch. Now back in his native Canada at Gluskin Sheff he continues to warn about a prolonged slump with high unemployment in the developed world. He tells Consuelo what it means for investors and where to find growth despite a stagnant U.S. and Europe. As this week’s WealthTrack guest, Dave Rosenberg reminds us, “how many monetary unions have ever worked?” He takes us back to the East African Monetary Union and the Scandinavian Monetary Union of over a century ago- neither one remembered “because they don’t exist anymore.” As he points out “the only monetary union that works is the United States.” And we fought a war to preserve it. How are we doing after three years of repeated and, in some cases, record amounts of fiscal and monetary stimulus? Not great. As Rosenberg points out, “no major economic indicator from employment to GDP to industrial production to real incomes has managed to get back to their prior cycle highs in late 2007.” Those are the unfortunate facts as are some other indicators Rosenberg is tracking, including home sales which are much lower than they were in late 2009; the S&P 500, which is at the same level it was more than a decade ago; and ten year’s worth of zero employment growth. The latest read on home prices shows they fell in nearly three-quarters of metropolitan areas in the third quarter. The vast majority of economists disagree with Rosenberg’s dire assessment, but increasing numbers of them, including those at the Federal Reserve are lowering their forecasts and predicting several more years of slow economic growth, low interest rates and uncomfortably high unemployment. In other words, the world is just starting to catch up to Rosenberg’s long time predictions. David Rosenberg is the chief economist and strategist of Toronto-based investment firm Gluskin Sheff. 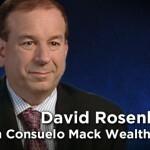 For years, Rosenberg was the influential chief North American economist at Merrill Lynch, where Institutional Investor magazine placed him on their coveted “All American All Star Team” from 2005-2008. His daily “Breakfast with Dave” report is a must read among his many fans. Rosenberg is known for being years ahead of the pack in spotting the housing and credit bubbles and predicting the serious and prolonged damage they would inflict on the U.S. and world economy and markets. But a depression? One of the topics we will talk about is why he is using the “D” word. If you can’t watch this week’s episode on television, you can always watch it by going to our website. It will be available starting Sunday, or Monday morning at the latest. If you want to see our WealthTrack episodes ahead of the rest of the pack, you can do so by becoming a subscriber to advance showings of WealthTrack. Click here to sign up. For those of you following my occasional Twitter, under my name ConsueloMack, I will be tweeting tomorrow. 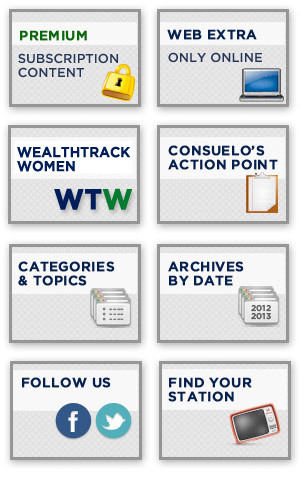 For those of you active on Facebook, you can contact us on our Consuelo Mack WealthTrack page. As always, make the week ahead a profitable and a productive one. This transcript is available here. 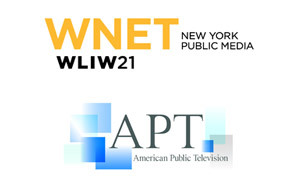 WEALTHTRACK Episode #903; This program was originally broadcast on July 13, 2012. Financial Thought Leader and Yale economist Robert Shiller. He predicted the bursting of the tech and housing bubbles. What does this visionary behavioral economist, author and market innovator see in our future now? Consuelo will find out.